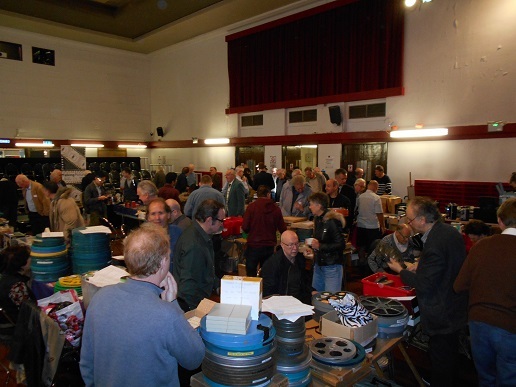 This is topic Harpenden 9.5 event today in forum 9.5mm Forum at 8mm Forum. Good weather for the gathering at Harpenden Halls today. A bit cramped due to some raked seating being left out reducing the space for tables nut plenty of activity. I'm sure Dominique will have better pictures as I had to leave early, but here are a few from me. Great photos, Brian, large and clear! 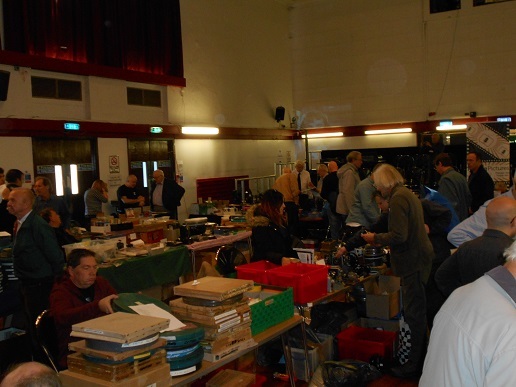 I had a good time there,picked up a few films and met a few familiar faces,all gauges on offer so something for everyone, Mark. It was a great day for 9.5 sound films hunters. Tony, from Buckingham had a table full of them ! And I could buy some from other dealers as well. There has been a projection of a rare tinted copy of Metropolis. I will post some pictures (not better than yours, Brian) when I will be at home (a thoug for me ; I have to heavy bags full of films to carry back to Belgium). 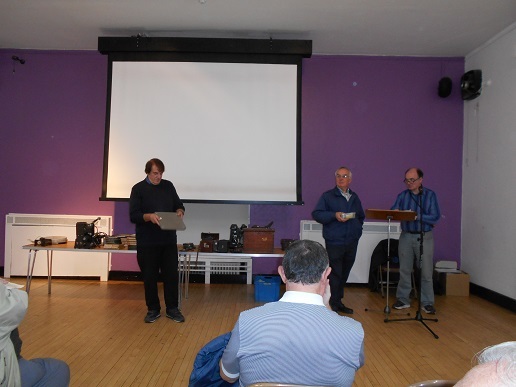 I was glad to see, once again, the British cine enthusiasts and look forward for the next great event next month in Blackpool. Nice to see you there Dominique and glad to hear you got a few films, Mark. Dom, I can't wait to see your photos, Dom! I really wanted to ask my classic question: "There were 9.5mm horror films? ", but Anna has anticipated me! What movie? Ah, my classic question number two! 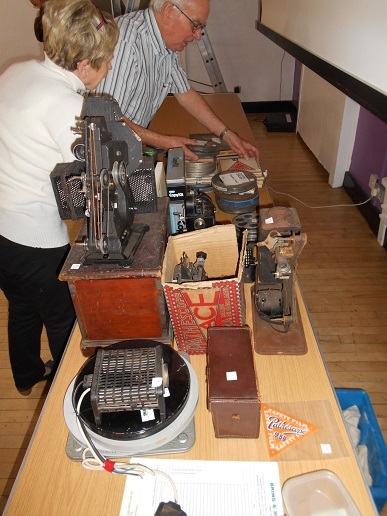 There were 9.5mm TAPE splicing machines? Luigi, I'm surprised bu your second question. You know the 9.5 CIR splicer, don't you ? The horror film Anna was refering to is...Metropolis. The film was introduced as a sci fi film but it can also be regarded as a scarry one. Just to be precise, it was not colorized (I don't know if the spelling colourized exists) but tinted. 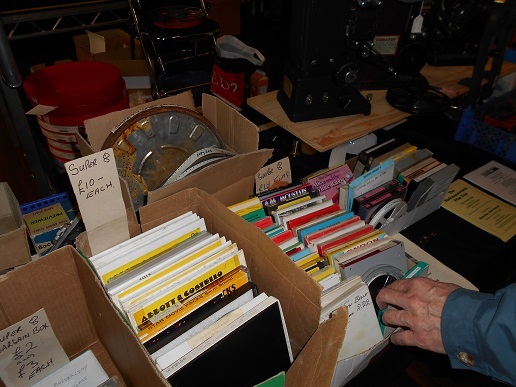 Tony Reypert with a full table of 9.5 sound films ! 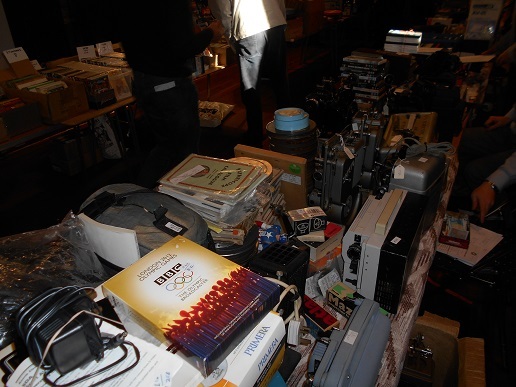 He also had this projector for sale. I was there and the screening of Metropolis was a definite highlight, as was the chance to chat to Kevin Brownlow. I'd just seen a screening in Huddersfield of his restoration of WINGS (1927) three days earlier so it was the perfect opportunity to thank him personally! Another view of the seller's room. 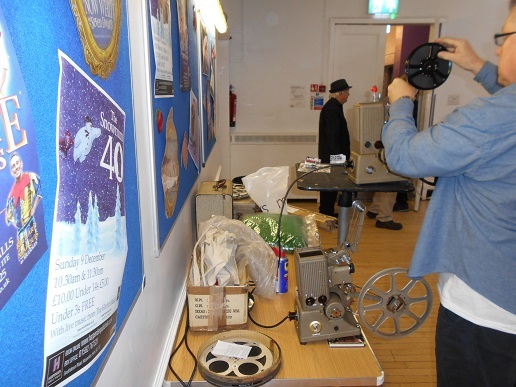 A 16mm projector in action. 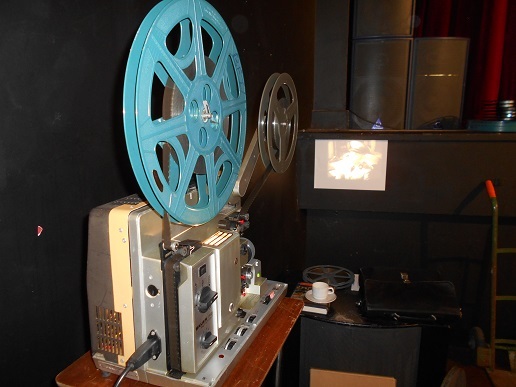 In the projection room, the two modified silent 9.5 projectors are ready for the two films to be screened : a British comedy (if anyone knows the title, I would be interested in it), then, as said before, a rare tinted copy of Metropolis. Thanks for posting those great pics which are most enjoyable, I am sure, to everyone on the forum. 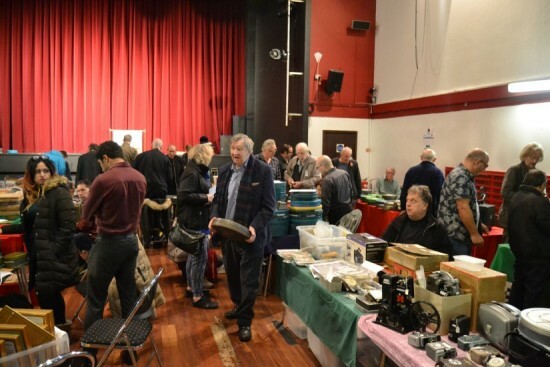 Is that "The Master" Keith Wilton in one of the photos? 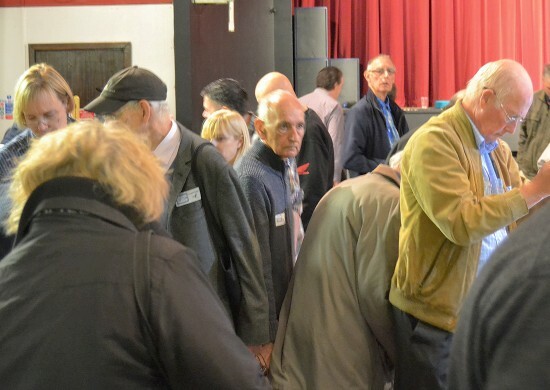 Paul - that is Keith Wilton in one of the photos. I attended but my rail journey was delayed, meaning that some people had left by the time I arrived! Glad you like the pictures, Paul. Here are the last ones. The lady who made a live music accompaniment during the projection of Metropolis. Needeless to say : a great moment. 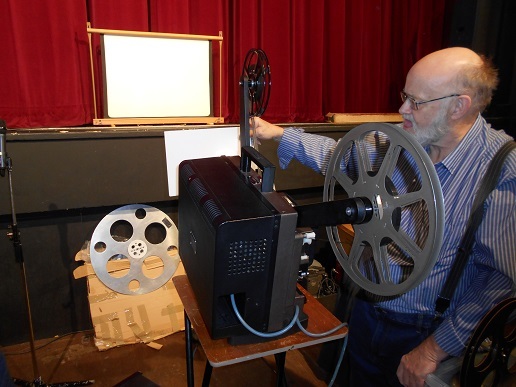 It was said that there are silent (filmstock, including 9.5) projections in London with a piano accompaniment. The lady on the picture (sorry, I don't know her name) is one of the pianists. 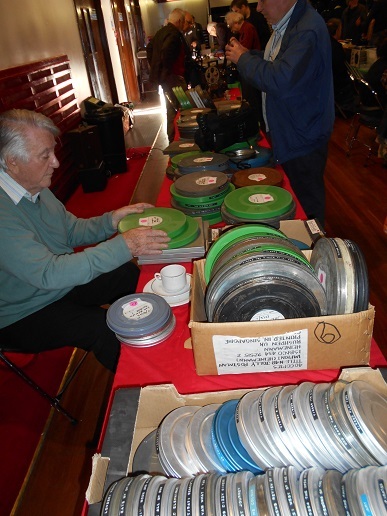 The films and the materials for the auction are being displayed. Forum member Anna, on the picture, is having a look. 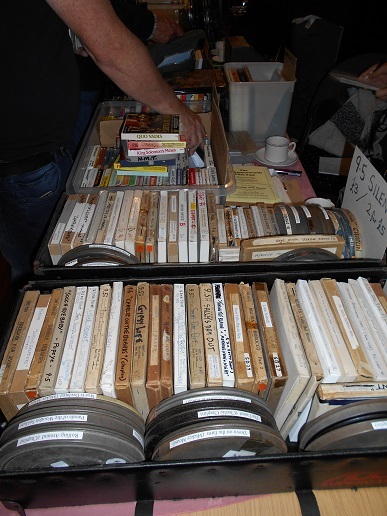 She was one of the lucky bidders who made several bargains (some films were sold at £1 or 2£). 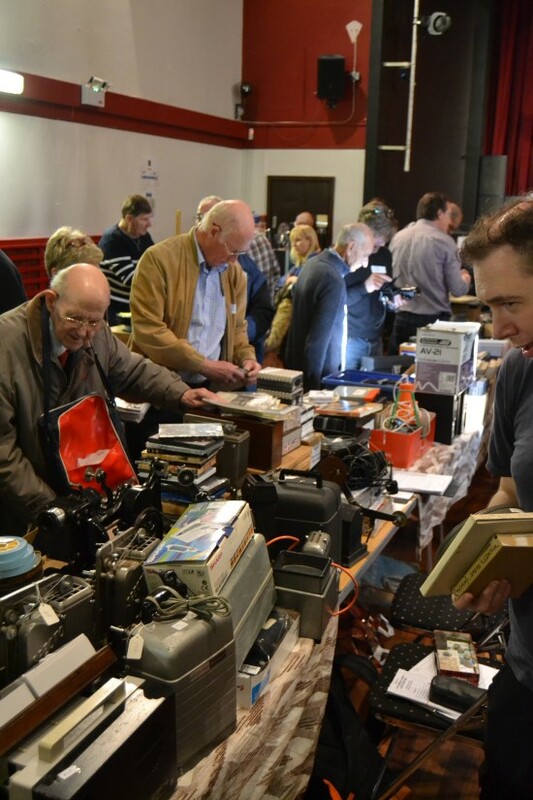 really nice to see these pictures of this event.thank you to those who took them and posted for all to see. 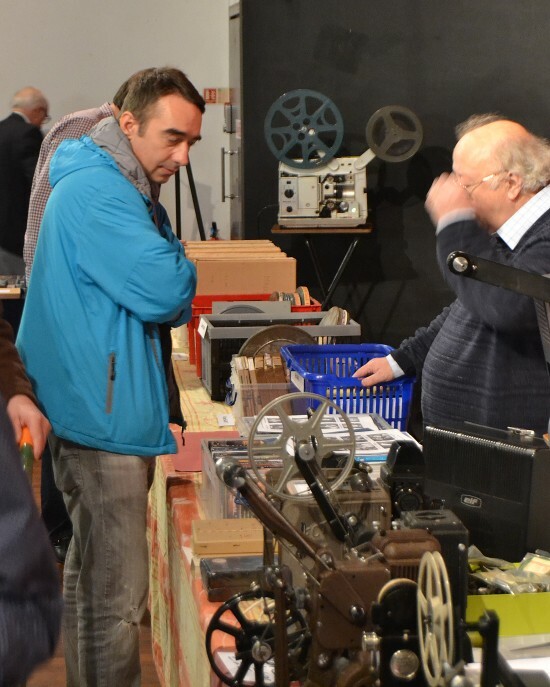 spotted my good friend Bob Nicholls talking with projections magazine publisher and editor Pete Travers. plus of course Keith Wilton,Tony Hutchinson and Simon McConway. hope to see them all at Blackpool. Ah, Dom, I still express badly in English! Ah, anyway, I always hope that someone able to modify has been able to obtain an alternative version, perhaps from one to 16mm... Sometimes I look on ebay if it's ever been done, something like that. I hope you will find one, Luigi. In 9.5, you have also films like The Cabinet Of Doctor Caligari or The Devil Bat. Pathé in France had more a "family audience" so, except King Kong, I don't think they released scary movies in 9.5 (but I may be wrong). Many catholic priests used 9.5 for their show (there are many religious films in this gauge) and one priest made even a catalogue of films with comments about suitability and instructions for the showman on which scene to cut to make the film appropriate for catholic audience (with '30s standard of course, so it's funny nowadays). Sadly, I don't own such a catalogue. You're right, Dom, the 9.5mm films catalog is very "family". I've been back for a long time to the 9.5mm copy of Caligari (my favorite movie, when I make shorts I sign L. Caligari ), but stops me the fact that it's not 100% complete. Instead, Devil Bat is that copy that on ebay at a "high price"? I apologize to the seller for this statement, if any. Really sorry I had to miss the fair, sounds like it was great as always. 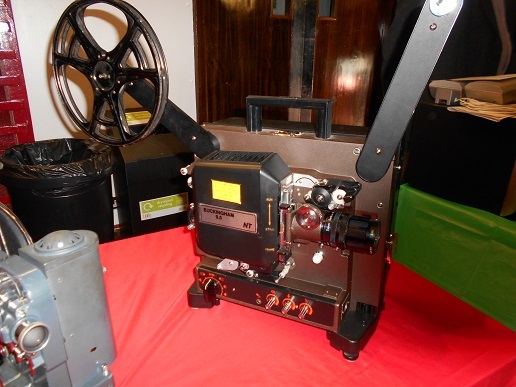 It was my print of Metropolis that was screened, the same one we ran at Pimlico in February. 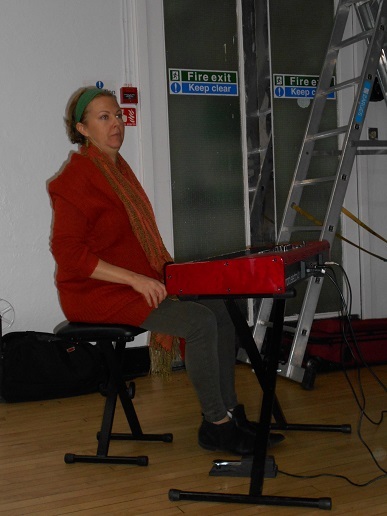 Meg Morley is outstanding - she often plays for shows at the Cinema Museum in London, where they regularly programme rare silent films, usually shown on 16mm or 35mm. (Google 'Kennington Bioscope' if you want to know more). She also sometimes plays for silent screenings at the BFI.